DUBAI: Habib Al-Mulla is used to media attention, but last Wednesday he had even more than his usual share of interaction with the world’s news outlets. He had just successfully defended his client in one of the most high-profile legal cases to come out of the UAE in years — the long-running saga of the decline and fall of Abraaj, and its founder and CEO Arif Naqvi. Al-Mulla, the doyen of Emirati lawyers, was called in by Naqvi to defend criminal charges brought by Sharjah business leader Hamid Jafar after checks totalling $300 million written by the Abraaj CEO were dishonored on presentation. After weeks of shuttle diplomacy between Dubai and London, where Naqvi had remained to avoid the threat of imprisonment in the UAE, Al-Mulla clinched a deal with Jafar that lifted the criminal charges — in exchange for Naqvi handing over millions of dollars of personal assets. The system of using personal and corporate checks as security in financial transactions is one of the characteristics of the UAE business scene, but has been increasingly criticized as a legal blunt instrument, unsuited to the country’s “smart” entrepreneurial ambitions. Last year Emirati policymakers changed some details of the law to make it less draconian, as part of the plan to bring in a modern bankruptcy structure in the UAE. Al-Mulla thinks it still has not gone far enough. “What is the point of a bankruptcy law if it cannot protect a defaulter while he restructures his business? For smaller checks there is no automatic imprisonment, and that is an important refinement. But it’s a half-cooked solution. I think we should do like other jurisdictions in the world, and decriminalize it entirely. I think we should get rid of security checks altogether and scrap imprisonment for civil debts,” he said. He does not agree with the UAE banks which argue that security checks impose a financial discipline on the country’s business culture. “Banks and finance companies will always want to continue with the current status because it is in their interests to do so, regardless of what dangers the economy faces as a result,” he said. “I don’t believe the criminalization of debt leads to financial discipline. It just means that less due diligence is done on a client or business partner before a transaction, because the banks believe they have the security of a paper cheque,” he said. The criminalization of checks is one of a number of measures weakening the UAE legal system’s global image, Al-Mulla believes. Barely a week goes by without some outcry in the international media about a perceived injustice in the UAE. “Does the Dubai legal system get a bad press? Yes, I think it does, and the main reason is that there is no government spokesman on legal issues. The Media Office (the official government communications agency) has no legal expertise. The response to any specific case is always reactive, when what is needed is a proactive media strategy to deal with cases as they arise. They need to deal with it on the spot, to engage with journalists here and abroad, not ignore them,” he said. “Dubai is always under a spotlight; it is not North Korea, where things happen in the dark. Dubai always has to engage with the outside world,” he said. Some legal experts argue that the UAE legal system’s poor image is a consequence of having English common law existing side by side with a Shariah-based system, and Al-Mulla agreed that was a factor. “I think some tension between these two systems is inevitable, but it is a good thing because it will eventually enrich the legal system here. There will be a coming together between the two systems. It will take years, but slowly it will build a legal system combining the two, and that is a good thing,” he said. 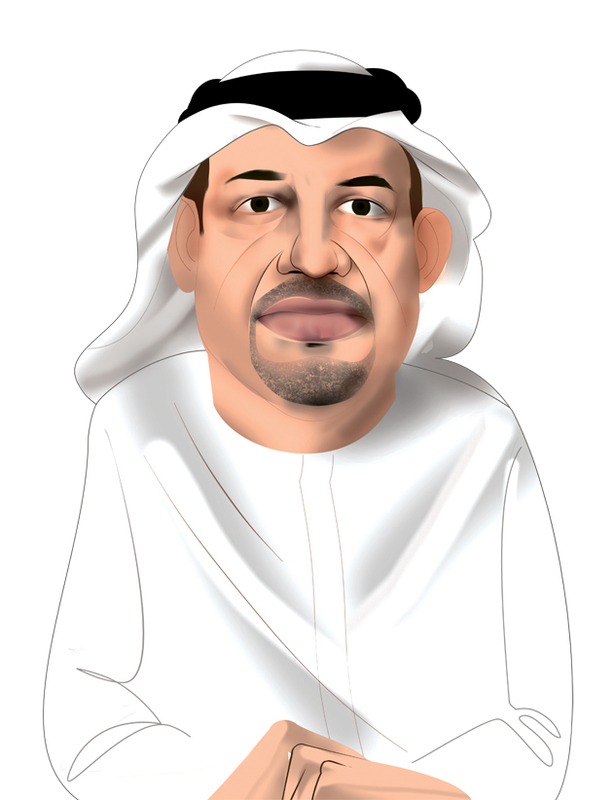 Al-Mulla, as the first chairman of the Dubai Financial Services Authority (DFSA) in 2004, was instrumental in setting up the common law structure of the Dubai International Financial Center, but has been intermittently critical of the way it has been run since. “The DFSA is the only regulator I know that is chaired by a person who does not have a legal or regulatory background. I think the outgoing chief executive, Ian Johnston, has had a good term, but as a body it has not come up with any new initiatives for the regulatory set-up here in UAE,” he said, insisting however that he did not want to be involved in the DFSA again. Despite the global interest in the Abraaj affair, he does not believe it has caused serious damage to the image of Dubai or the DIFC, which regulated some parts of Abraaj’s global operations. “I don’t believe Dubai’s reputation has been damaged. The DIFC entity is not involved. There are various Abraaj entities which are subject of different jurisdictions. Even some developed jurisdictions have encountered worse issues, like the Madoff scandal and the collapse of Lehman Brothers, and have survived,” he said. There are big legal changes underway in the UAE’s business set-up, with plans to allow foreign companies to own 100 percent of businesses, currently only permitted in free zones. Al-Mulla believes this is a good thing, but warns of the damage it might do to the free zones, which have been one of the main drivers of the UAE’s economic growth over nearly 20 years. “Back in 1996 I said that the UAE should do three things: Allow foreign ownership of real estate, permit long-term residency for investors and certain other suitable foreigners, and allow full ownership by foreigners of onshore companies. Just now, we are seeing progress on all three, but it has taken a long time,” he said. “The free zones will definitely be affected when full foreign ownership is allowed. They will lose one of their most competitive advantages, and will need to find another if they are to continue to thrive — they will have to reduce fees, make the registration process more efficient, make it more digital. “I think in 10 years’ time the free zones will struggle to continue as they are now. Maybe there will not be as many of them as there are today,” he added. The recent moves on full foreign ownership were part of a government stimulus package implemented to reboot the UAE economy ahead of the Expo 2020 event, but Al-Mulla takes a positive view of the business scene in the country. “I don’t believe the recent changes have been forced on the government by the economic situation. Otherwise they would have introduced them 10 years ago, during the global financial crisis, when things were a lot more serious. The whole global economy is slow, but in the long run, I’m optimistic, as long as oil stays above $70. Dubai is a service center for oil-dependent economies so a high oil price is good for the emirate,” he said. Nonetheless, Al-Mulla expects further government initiatives, and possibly an extension of general taxation heralded by the introduction of value added tax at the start of the year. “They say that only two things are certain in life — death and taxes — and we’ve already got VAT. I think corporation tax is going to happen some time, but it has to be gradual and slow. We have to allow businesses time to get used to it. And of course government fees will have to be reduced from their present level if corporation tax is to be introduced,” he said. 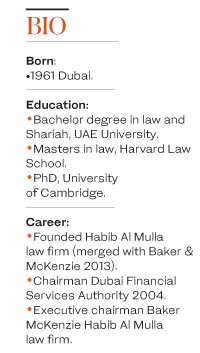 His firm, now part of the global Baker & McKenzie law empire, was one of the first foreign firms to open in Saudi Arabia, about 35 years ago, and it offers the full range of corporate law services from offices in Riyadh and Jeddah. “I’m positive about the changes going on in Saudi Arabia, but it will take some time before we see the full results of the Vision 2030 strategy,” he said. The Kingdom can learn from the Dubai experience, he believes. 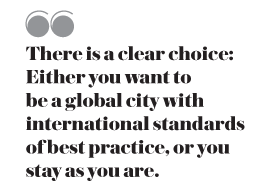 “There is a clear choice: Either you want to be a global city with international standards of best practice, or you stay as you are. Dubai in the past has never been content just to stand still,” he said.